Luau parties are a great change from the ordinary casual out-door party and luau party recipes are the cure for the common party food. All fantastic luau parties have the same things in common: great music, great decorations, and great food which will help you set the theme and get your guests in the aloha mood. 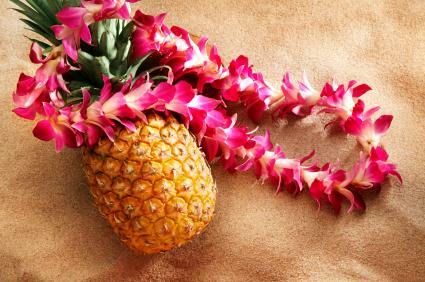 These luau party recipes will bring the exotic flavors of the islands to your party. When getting your Luau party recipes in order make sure you have a great recipe for Poke (pronounced po-keh). Sometimes called Hawaii's soul food, Poke will bring the soul of the tropics to your party. Mix the yellow onion, sliced green onions, limu kohou, inamona, and sesame oil. Add the Ahi and toss to coat. Lomi is Hawaiian for massage and that's just what you have to do to the salmon in order to get the flavors to mingle. Serves 6. Shred the salmon into small bits with your hands. Place the salmon into a bowl and then add the tomatoes, pineapple, lime juice and onions. Massage the mixture until all of the ingredients are broken and mixed well. Cover the bowl with plastic wrap and chill for at least one hour. This is great on its own or with Poi. A big platter of Laulau will keep your guests happy as the party progresses. This recipe makes 12 Laulau. Prepare the ti leaves by washing them while the stems are still on them. Once the leaves have been washed, take one of the leaves and hold it with the stem pointing up and the shiny side away from you. Place one thumb about 3 inches from the edge of the leaf where the stem protrudes from the leaf. Place your other thumb about four inches farther down the leaf from your first thumb. Bend the leaf away from yourself until the stem snaps. We are trying to pop the stem off the leaf without tearing the leaf. Carefully pull the stem away from the leaf. Do this for all of your ti leaves. If you were unable to find ti leaves and are using banana leaves instead, you will not have to remove the stem. Remove the stem and veins from the lu'au leaves. Cut the pork into 12 pieces. Rub each side of the pork with salt. Cut the butter fish into 12 pieces. Start your steamer and let it become hot. Stack four of the lu'au leaves with the points of the leaves facing different directions. Place a piece of pork in the center of the leaves. Place a piece of fish on top of the pork. Fold the leaves around the filling to completely wrap it. Warp each bundle with the ti leaves and secure the leaves using butcher's twine. Place the laulau in the steamer. You can layer them if you have to. These are just a few of the luau party recipes that you can use to make your luau party fabulous. You can use luau party finger foods to fill out your table or any other luau party food recipes that you happen to have on hand.